BEIJING - An alliance of sixteen of the largest State-owned companies wants to accelerate development of electric vehicles in China, a move which underscores the country's ambition to be a world leader in new energy vehicles. 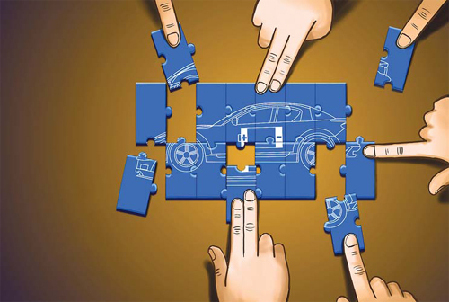 The alliance, formed on Wednesday, is gearing up to invest 100 billion yuan ($14.7 billion) on electric vehicles by 2012, according to media reports. Guided by the State-owned Assets Supervision and Administration Commission of the State Council (SASAC), the alliance was formed by almost all the major players in the related sectors, including the country's top three oil majors, top two power grid operators, and two major automakers - China FAW Group Corp and Dongfeng Auto Corp. The alliance aims to speed up research and development in vehicles, fuel cells and charging systems, as well as setting some unified standards, said SASAC Minister Li Rongrong. China has already made some progress in areas like auto parts and fuel cells, and should take further steps to build internationally competitive Chinese electric car brands, Li said. Early in 2008, the central government launched a national campaign aimed at getting 1,000 electric vehicles on the roads in at least 10 cities each year to encourage people to buy electric cars. In June, the Ministry of Finance kicked off an incentive policy in five pilot cities - Shanghai, Shenzhen, Hangzhou, Changchun and Hefei - providing subsidies of 60,000 yuan for a pure electric vehicle, and 50,000 yuan for a plug-in hybrid vehicle. Chinese automaker and batterymaker BYD, a company which Warren Buffett has invested in, launched its first battery-powered car in 2008 and formed a joint venture on electric cars with German automaker Daimler in March. The consulting firm McKinsey & Company said the US is the most likely to spearhead a movement toward electric cars from gasoline-driven cars. McKinsey ranked the US first in its electric-vehicle index, ahead of France, Germany and China. Many western European countries have invested heavily in the development of green energy technologies. Li said the alliance is open to other companies, both domestic and overseas. Use of cleaner energy vehicles is in line with China's aim at improving energy efficiency and cutting pollution, said Dai Yande, deputy director of the Energy Research Institute (ERI) affiliated with the National Development and Reform Commission. "It is hard for the country to achieve its energy and environment targets without environmental friendly cars," he said. Use of cleaner energy vehicles not only reduces China's reliance on imported oil, but also helps the country cut greenhouse gases emissions, he added. China has pledged to reduce its carbon intensity by 40 to 45 percent in 2020 from the 2005 level. The country has also set a target of raising the use of non-fossil energy to 15 percent of total energy consumption. Car sales in China are expected to reach 17 million this year, up 30 percent from last year, China Passenger Car Association said in July. The alliance will help promote the use of electric cars in China, and the establishment of industry standards will be of immense benefit, said Wang Liusheng, an analyst at China Merchants Securities. However, the alliance should include more automakers, such as China's biggest auto manufacturer SAIC Group and BYD, he said. "Otherwise, the effect will be limited across the total automobile industry."